“Toys are the new textbooks,” says designer and social entrepreneur Ilana Ben-Ari. “If we're going to be ready for the challenges and opportunities of the 21st century, we need to value play and emotional intelligence, in our schools and our offices.” Ilana is the inventor of The Empathy Toy, an award-winning toy being used in over 1,000 schools and companies that teaches communication, collaboration, and creativity. Her interactive keynotes and workshops take an unusual approach—they open our eyes by taking away our sight. When so many of our jobs are becoming automated, the future of work and learning lies in social and emotional intelligence. Ilana gives audiences a visceral understanding of the power of empathy, and reveal how an empathic approach can fundamentally reshape and strengthen the skills we need to succeed as individuals and as organizations. 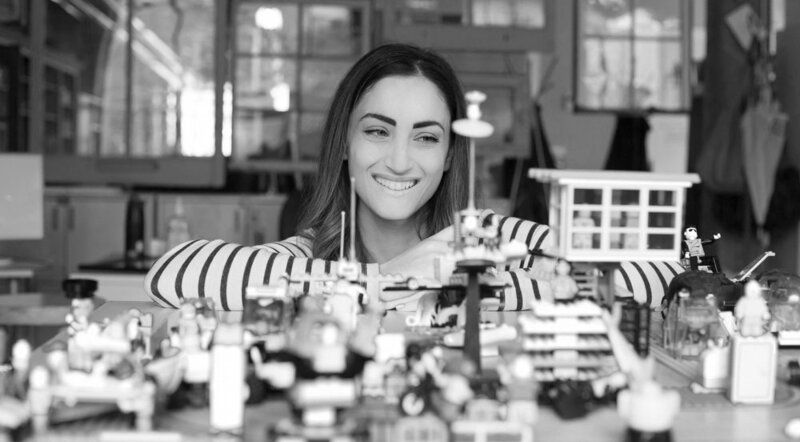 Ilana Ben-Ari is the founder, CEO, and lead designer of Twenty One Toys. The company’s first product is The Empathy Toy, a 3-D abstract puzzle that was originally designed with the Canadian National Institute for the Blind to bridge the communication gap between visually impaired students and their sighted classmates. It is now used as a tool for empathic learning and creative education for people of varying ages and abilities. Already in thousands of schools, homes and offices worldwide, it was featured in TIME as one of six new technologies shaping classrooms and offices of the future. Her new product, The Failure Toy, will be released soon. Ilana has won multiple awards, including C2MTL's emerging entrepreneur award. She has spoken at TEDx and at conferences around the world, and has been featured in the Guardian and the Independent, among others. She has been working at the intersection of design and social innovation for a decade at studios in Montreal, Helsinki, London, and most recently, Toronto. What does it mean to be human in the age of intelligent machines? What are the job skills of the future? How can we train ourselves—and our employees—to be indispensable to business success? In this interactive keynote, entrepreneur and inventor of The Empathy Toy Ilana Ben-Ari identifies creativity and emotional intelligence as two of the top skills workers need—now and in the future. Much of our work is becoming automated, she says. But a successful interaction between two human beings, or a creative way of thinking, can’t be automated. It can, however, be taught. In a keynote and workshop customized for you, Ilana will first reveal the future of work and learning to your audience members. Then, she will lead them through a series of games and exercises that teach empathy, collaboration, communication, leadership, and creativity. It’s a fun, creative, and deeply human session that your audience will both enjoy and greatly benefit from. Ilana Ben-Ari’s company started with a simple Kickstarter campaign. Now, her first product, The Empathy Toy, is “one of six new technologies shaping classrooms and offices of the future” (TIME), and she’s about to launch her next product, The Failure Toy. Why are her toys so game-changing? Good design. And how will she move forward with her plan to develop 19 more toys? Good business. In this talk, Ilana tells two intertwining stories: her journey as an entrepreneur; and the importance of design thinking. She reveals how design can be a much more powerful force than many of the technological and digital tools that are being implemented in schools or workplaces—because it has the potential to change the way we learn. And, she shares her successes and failures as an entrepreneur without any investors, and what she has learned about the business of design. Ilana is a delightful speaker, and this is an inspiring and instructive keynote. Her takeaways on innovation, creativity, and collaboration can—and should—be implemented by any audience in any organization. Contact us to learn how Ilana can craft a message for your audience.